The Hubble Space Telescope has survived 20 years in space? including unprecedented surgical repairs to its mechanical eyes, heart andbrain ? to become one of the most beloved astronomical icons in history. But it wasn't always the crown jewel of space-basedastronomy. In fact, just after it reached orbit on April 24, 1990, the HubbleSpace Telescope was on the verge of becoming a national embarrassment. Ithad a flawed mirror and took fuzzy pictures that were a far cry from the crispviews deep into the universe that astronomers expected. Ed Weiler, NASA's associate administrator for science,was there at the beginning. It was he who ? as Hubble's program scientist atthe time ? broke the news the press and the world that Hubble's main mirror hada major defect ? a spherical aberration caused by a manufacturing error.It would take three years before NASA was ready to mount a repair mission in1993, but Weiler was also there on Dec. 18 of that year when the first new imagesfrom Hubblereached Earth. Those photos were crystal clear. "It was just vindication," Weiler toldSPACE.com, adding that it was most cathartic moment in his life since the birthof his two children. "We realized immediately that we had nailed theprescription." What NASA and a crew of space shuttle astronauts had donewas effectively perform eye surgery on Hubble ? a 12 1/2 ton space telescopethat flies more than 350 miles (563 km) above Earth. The mission was adesperate bid to salvage a space telescope built by NASA and the European SpaceAgency which has since swelled into a two-decade, $10 billion-mission toexplore the universe. Two new cameras, including the Wide-Field Planetary Camera2 (WFPC-2) ? which took many of Hubble'smost famous photos ? were installed during the fix. You can see them todayat the Smithsonian Air & Space Museum in Washington, D.C., a short walkfrom Weiler's office at NASA headquarters. "I call it the camera that saved Hubble," Weilersaid of the WFPC-2. "I really give it credit for putting Hubble on theworld map, so to speak. And now being able to go up to it and almost touch it ?is really quite incredible. " The new cameras corrected Hubble's vision completely bycounteracting the spherical aberration mirror defect afflicting the spacetelescope. "Spherical aberration happens when the primary mirroris polished incorrectly," John Trauger, WFPC-2 principal investigator atNASA's Jet Propulsion Laboratory in Pasadena, Calif., explained last year justbefore the last Hubble flight. "You can think of the mirror as a veryshallow bowl. With spherical aberration it's just a little too shallow, alittle too flat." Faulty test equipment used during the manufacture ofHubble's 8-foot (2.4-meter) mirror was later blamed as the cause. All of thelater instruments installed on Hubble during subsequent servicing flights werebuilt to automatically take the mirror flaw into account while observing theuniverse. The 1993 repair mission saved Hubble from going down inhistory books as a colossal cosmic flop. The drama surrounding the telescope'striumph over blurry vision ? as well as the stunning photos that followed ?have endeared it to scientists and the public ever since. Hubble has uncovered countless mysteries of the cosmos,including supermassive black holes, dark matter and dark energy, the existenceof planetary systems beyond our own. The orbital observatory has also helped rewrite astronomy textbooks and shownthat stars formed much sooner after the universe began than previously thought,and that the process that forms planets like Earth and its solar system arerelatively common. Weiler, for one, is thrilled. "I always like things that show we humans don't knoweverything we think we know," he said. Hubble has also peered back to just 600,000 years afterthe birth of the universe, which is 13.7 billion years old. Still, itslongevity has surprised even its creators. "If you would have told mein 1990 that Hubble was going to do everything we promised ? that we'd go waybeyond those capabilities, and go beyond 15 years to get to 20 years, andprobably have 25 or 30 to look forward to, I would have told you we were on thewrong medication," Weiler said. Weiler has added his own take to the Hubblestory in the new book "Hubble: A Journey Through Space And Time,"which was released this month on the heels of a new IMAX film ? "Hubble3-D" ? which chronicles the space telescope's legacy and final overhaul. Hubble was the first of NASA's Great Observatories inspace. It was named after renowned astronomer Edwin Hubble. But unlike the space observatories that followed, only Hubblealone was built to be visited by astronauts again and again. In all, astronautsflew five Hubble servicingmissions ? most recently in May 2009 ? to swap out old, worn out parts andinstall new state-of-the-art instruments. "I had Hubble in my hands, literally. We all did andthat's a tremendous responsibility," former astronaut John Grunsfeld, whoflew to Hubble three times (including the last flight), told SPACE.com in arecent interview. "Rule number one was 'Don't Break Hubble.'" After the first servicing mission in 1993, astronauts returnedto Hubble in 1997, 1999, 2002 and 2009. They performed brain surgery to replaceold main computer parts, and mechanical heart surgery to upgrade Hubble's powerand solar array battery systems. NASA initially cancelled the final servicing mission toHubble after finding it too risky following the tragic loss of shuttle Columbiaand seven astronauts in 2003. After toying with the idea of sending a robot tofix Hubble, NASA decided to send one last crew instead on the STS-125 mission,which included Grunsfeld. ? During the last mission to Hubble, Grunsfeld and hiscrewmates fixed broken cameras that were never built to be repaired in space.The astronauts removed hundreds of tiny screws, ripped a handhold bar off toget to one broken instrument and performed five grueling back-to-backspacewalks knowing that if something went horribly wrong, they'd have to waituntil a second space shuttle could be launched on a rescue flight. Despite those daunting odds, the Hubble repair marathonwas a complete success. In the late summer of 2009, the first new photos fromHubble revealed spectacular new views of the universe. 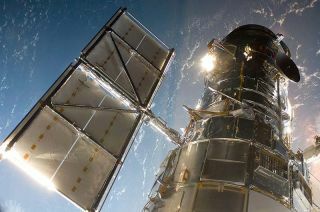 With the final upgrades, Hubble is just about acompletely new space telescope. Its new instruments should make it 90 timesmore powerful than when it launched, NASA officials have said. "This isn't your grandfather's telescope like it wasin 1990," Weiler said. Since leaving Hubble for the last time, Grunsfeld hassince retired from spaceflight. He left NASA's astronaut corps to join Hubble'sscience team at the Space Telescope Science Institute in Baltimore, Md., wherehe serves as deputy director. It's Hubble every day, not a bad trade, he has said. "The observations that Hubble makes, and the abilityof astronomers and the scientists to figure out how the universe works fromthese observations is even more amazing than anyone has ever imagined,"Grunsfeld said. NASA is now working on its next great spaceobservatory ? the infrared James Webb Space Telescope ? slated for launchin 2014. Weiler and other astronomers hope Hubble will still be going strong bythen in order to work in tandem with the new space telescope. ?? But for now, Weiler said he plans to spend Hubble's 20thbirthday at home, most likely cutting his grass and dreaming of the distantparts of the universe the telescope has seen. And, of course, he will think of theAmerican people who made the space telescope possible, then funded efforts tofocus its vision and keep the cosmic window on the universe wide open. "It was the American taxpayers that made Hubblepossible," Weiler said. "And I thank them for all that they coulddo."